Following a recent capital investment and the growing global interest from the marine sector, Sea Machines Robotics said it has been expanding its crew and is poised for further growth, expecting to deliver first generation systems to marine customers this summer. Over the past two months, Sea Machines has added multiple new members to its experienced team of engineers, scientists and mariners. Among the new hires is Phil Bourque, the company’s new director of business development. Bourque is tasked with building the sales and marketing structure of the company, as well as spearheading a global initiative to spark partnerships with commercial marine companies. “Phil’s marine relationships span the Americas, EMEA and APAC regions and he will be a key part of bringing the Sea Machines technology to the global market,” said Sea Machines CEO, Michael Johnson. Bourque comes to Sea Machines with a background in international sales management, having built much of the global sales and support network for Seakeeper Inc, the manufacturer of marine gyrostabilizers. 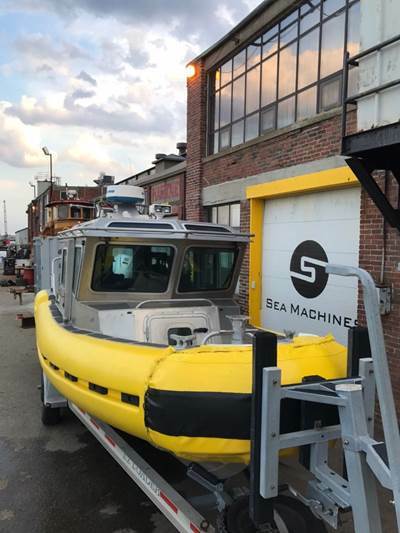 Sea Machines sells its autonomous system as kits to boat builders and retrofit projects around the world. Retrofit projects will be supported by a global network of certified installers. The company said its first product, the SMR-300, allows vessels to be operated from a remote station, providing direct joystick control and computer-station based collaborative autonomy.